I had a tough time with this one. It’s a National Book Award Finalist, so it feels like one of those books that you’re supposed to get something deep from, or appreciate, or something. I hate it when I feel like I’ve missed the boat. And the truth is, it’s not a book I ever would have picked up on my own, but Kevin, my 15-year old, is being required to read it for his freshman honors English class, and he’s really enjoying it (more than he enjoyed The Good Earth! ), and he urged me to read it. And I love it that he’s reading more grownup literature these days and that he wants to share his love of books with me, so I obliged him. 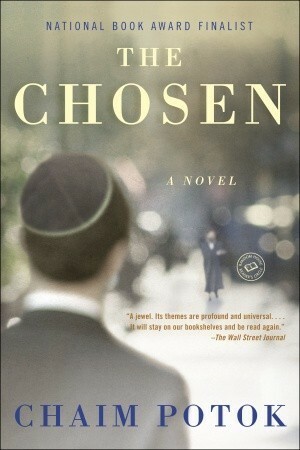 Originally published in 1967, The Chosen is the story of an unlikely friendship between two teenaged boys living in a predominately Jewish town in New York during WWII. Narrated by one of the boys, Reuven, an Orthodox (or observant) Jew who lives with his widowed father, he tells of his friendship with Danny, a Hasidic Jew and the son of a tzaddik. I’m still not exactly sure what a tzaddik is, but it seems to be a person of great importance in Hasidism due to the belief that they possess a direct line to God. The story managed to hook me by starting out with a suspenseful baseball game between Reuven and his apikorsim (a secular Jew, or a Jew educated in secular matters who may reject basic tenets of Judaism) teammates and Danny and his Hasidic teammates. The game ends violently when Danny, up to bat, deliberately hits the ball aiming at the Reuven’s head, successfully smashing the ball into his face and nearly blinding him. Reuven ends up hospitalized for several days, and during that time, the friendship between the two boys is born. What was difficult for me was the confusing aspects of the different Jewish sects. Apparently, Hasidic Jews hate non-Hasidic Jews, and non-Hasidic Jews are contemptuous of Hasidic Jews. (Hence, the unlikeliness of the friendship between Reuven and Danny.) I don’t understand the first thing about Hasidism or Orthodoxy, or really very much at all about even your run of the mill Reformed Jews (even though I’m married to one), so a great deal of the scholarly discussions in the book between the characters about Talmud, the Torah, etc. just went right over my head. The baseball game which comprises the first chapter is the most action that takes place in the entire story; the rest is a lot of conversations and reflection. I’m still not sure what the point of the baseball game was; both teams seemed passionate about it, and yet, baseball is never again mentioned in the story. I also didn’t get the point of Reuven’s hospitalization after the ball game. It takes up several chapters, and during his hospital stay, he meets several intriguing people: Billy, a little boy left blind after a car accident in which his father was driving and his mother was killed; Mr. Savo, an ex-boxer who loses an eye; and Mickey, a little boy with stomach problems who has spent most of his life in the hospital. When Reuven is discharged from the hospital, these other people’s fates are left a mystery, you never hear another word about them, and I was left wondering what the point was in developing their characters in the first place. Anyway, the story spans about five or so years, during which time we learn how Danny is in line to take over his father’s position as tzaddik, only Danny doesn’t want to. He wants to become a psychologist, but is too afraid to tell his stern father who is “raising him in silence” (another confounding concept). Reuven, on the other hand, has a close, loving relationship with his gentle, scholarly father, who would love nothing more than to see Reuven become a university professor, only Reuven wishes to become a rabbi. I guess the real question is: can friendship transcend fundamental differences in beliefs? And how can people break out of the molds created for them by those who came before them, and remain intact in body and soul? Ahhh, it was work, this book. I was glad when I was finished with it. And surprised that my 15-year old is enjoying it so much! I'm Lisa. Mother of seven. Wife. Writer. Reader. Books are my vice.